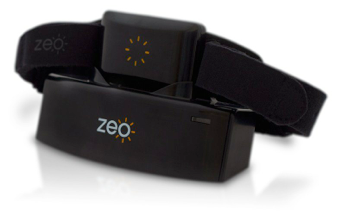 Zeo have been making products around sleep for many years. But now they have decided to sculpt an iOS centric product. And it’s called the Zeo Sleep Manager - Mobile. Coming in an all black design, the unit blends very well with most iOS devices. The charging dock as well as the front of the headband have an exterior glossy black, that looks very nice on a bedside cabinet. The headband is fully adjustable and is supposed to be worn in a specific way. Three small pads are located on the inner front of the band and these are meant to be lined up against your forehead. Throughout the night your head will twist and turn resulting in it slipping slightly and in turn you will get a moments of no data for your sleep. The headband is very comfortable to wear and hasn’t got any elements which dig into your head. The headband is placed onto of the dock and it charges without the need to put any cable between the two. Instead it uses magnets to pass the electricity. However I found that I would get up in the morning and drop the headband onto the dock and it wouldn’t be charging because it wasn’t quite square with the magnets. If the rear holder on the dock was brought further forwards this problem wouldn’t occur. On the front is a blue LED indicator which flashes when charging and stays a steady blue when charged. I found myself leaving the headband on the dock throughout the whole day and when it came time to go to sleep i’d remove it, knowing enough charge would get me through the night. To connect your headband to your iPhone, iPod touch or iPad. You simply go to Settings>General>Bluetooth. Then you should remove the band from the dock and it will appear as a device you can pair with. Click to pair and you’re done. Now you will need to plug your device in so it’s charging and download the free ZeoSleep App and you can now begin tracking your sleep. The whole setup went hiccup free. The App is very simplistic in design and that makes it very easy to navigate just before going to sleep. You can set an alarm, view sleep history, in a graph form, sync results to the MyZeo website (a feature I couldn’t get to work). Your sleep is claimed to be tracked with ‘proven scientific accuracy’. And after one week of use I’d say it’s true. My sleep patterns reported back to me via the App were very consistent each day. The data shown reports the amount of time you were asleep (it can very precisely detect if you’re not asleep) and what kind of sleep it was. Three different types are reported to us via the App and they are REM, deep sleep and light sleep. I seemed to be having a mixture of all however I kept waking up randomly throughout the night which I seemed to not do on weekends, that was very interesting to me. The more times you wake up, the more points are lowered of your ZQ Sleep Score. This score represents your sleep in ‘a higher the better score’ way. My scores were quite high due to me having a decent amount of deep sleep which I assume is a good thing as more points are awarded to this than any other type of sleep. My REM sleep was also quite high and this state of sleeping is when you’re supposedly dreaming and it translates into mental clarity, physical well-being and peak performance when awake. But my light sleep score was low, usually representing less than a quarter of my sleep type throughout a night. Suggesting i’m very relaxed? This knowledge of being able to see your different types of sleep in detail from various nights is all very interesting but trying to improve upon what I already had (a pretty good score) seemed very difficult. 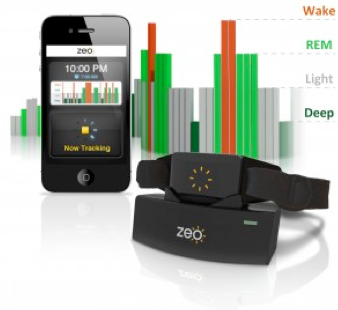 I have’t been able to make any difference in my sleep with the seven personalised tips Zeo give you. But I guess this isn’t the kind of product aimed at me, it’s aimed at people who have poor sleeps and would like to improve it. Now one aspect of sleeping I don’t like at all is the getting up and via a specific time on an alarm. I really hoped the Zeo Smart Wake feature would truly work to make waking up seemless. But it doesn’t. Claiming to wake you up at the optimal point in your sleep cycle, it just feels like another alarm clock. Don’t worry it doesn’t wake you up in the middle of the night because it thinks you’re at your optimal point to do so, that really would be annoying. You can set a time you’d like to be up by and it will wake you up within an allocated time amount of say 40 minutes. Music gently plays which is quite relaxing to listen to but in the morning any noise is annoying. It doesn’t take the edge off getting getting up. Having to have your device turned on and I mean with the screen on throughout the whole night, is very annoying also. If in someway possible i’d like that to be a feature which was optional, if it was you wouldn’t be required to have your device charging. Overall the ZeoSleep is easily docked, comfortable to wear, has an easy set up process, tracks your sleep precisely and has nice a functional App alongside side it. The things that don’t work are far outweighed by what does.